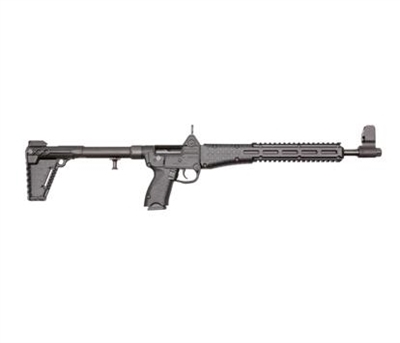 The SUB-2000™ is a semi-automatic rifle chambered for the 9mm Luger . Different versions of the SUB-2000™ rifle will accept most double column handgun magazines (see list below). By rotating the barrel upwards and back, the SUB-2000™ rifle can instantly be reduced to a size of 16.25 x 7 inches for ease of storage. The polymer of the weaponis made of an impact modified glass reinforced Zytel. Two integrated Picatinny rails come standard on the SUB-2000™ forend for mounting compatible accessories. The forend also includes five mounting slots per side, configured for various M-LOK™ accessories. The stock can be adjusted to three different positions for shooter's comfort. Each position adds approximately 5/8 of an inch to the overall length of the weapon, with a total extension of 1.25 inches in the further rearward position. The stock includes a single point sling loop attachment, a slot for adding a nylon sling loop (1.25" wide is ideal), and a Picatinny rail on the bottom for adding small accessories. 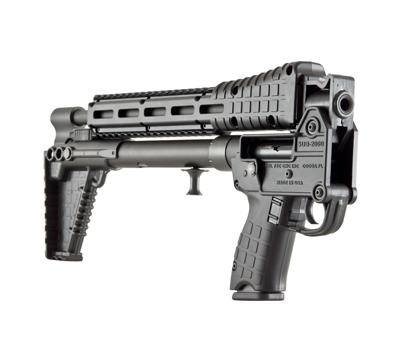 The SUB-2000™ features a push-bolt safety located behind the trigger on the grip assembly. The bolt can be locked in the rear position by cycling the bolt to the rear and rotating the operating handle up into the cutout on the receiver. The rear sight is of aperture type and the AR style front sight can be adjusted for windage and elevation. The thread protector on the SUB-2000™ is removable, if the shooter desires to replace the thread protector with a compatible accessory for the 1/2"-28 threads (9mm model) or 9/16"-24 threads (.40 cal S&W). The SUB-2000™ can easily be disassembled for cleaning or inspection without tools.